There were purple streamers and balloons, cookies with purple icing, purple props for the photo booth and purple prizes for games. 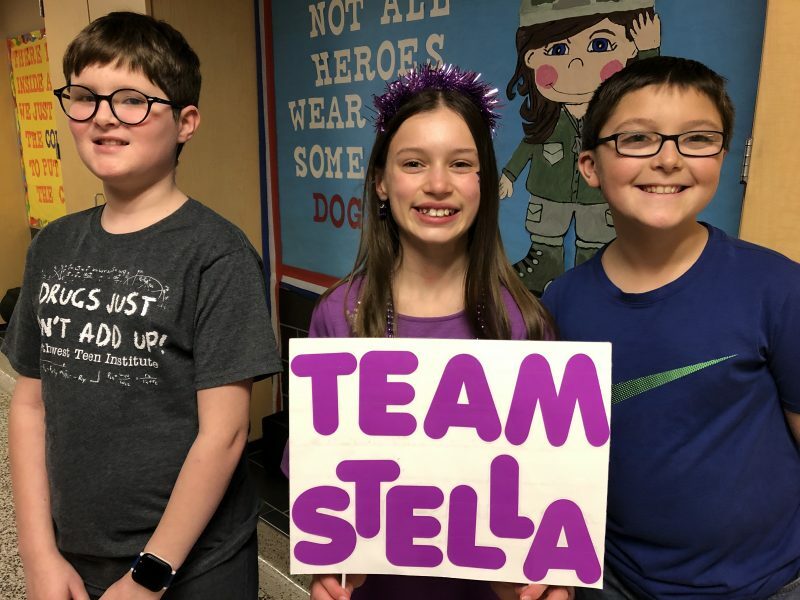 The purple party in Stella Miller’s fifth grade classroom at W.S. 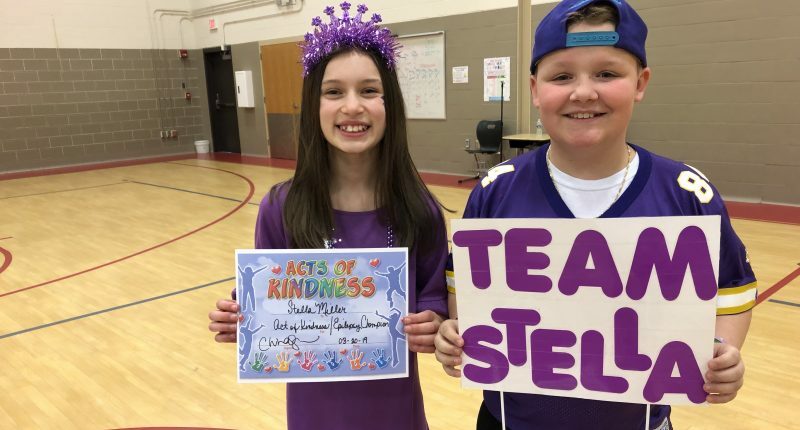 Stinson Elementary School in Canal Fulton was a celebration of Epilepsy Awareness Month and a reward for Stella’s class in collecting the most teddy bears for Akron Children’s Hospital in competition with the other fifth grade classes. 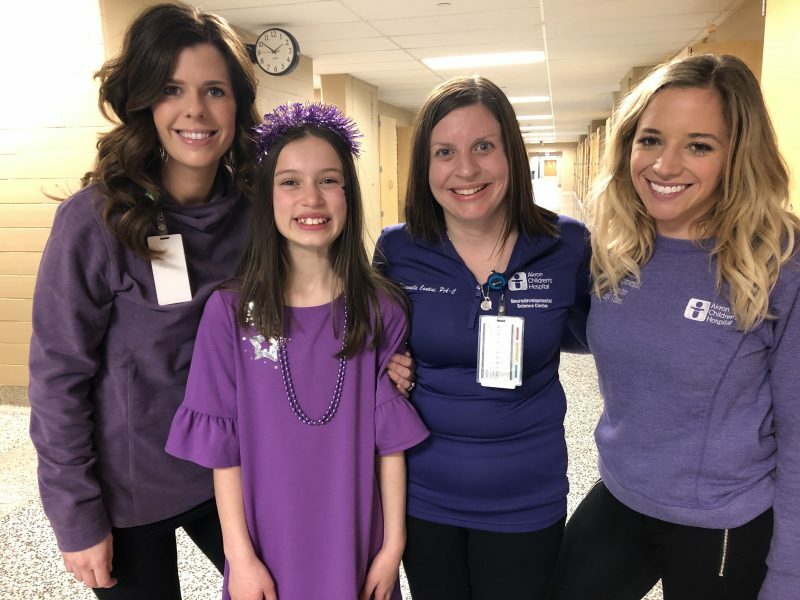 In all their purple glory, NeuroDevelopmental Science Center providers (left to right) Amanda Delaratta, Shawnelle Contini and Mackenzie Feathers join patient Stella Miller to celebrate Epilepsy Awareness Month at Stella’s school. Stella, who was diagnosed with epilepsy at age 8, was dressed like a purple princess and, with her mom, Andrea Jenkins, clearly loved playing party hostess as her classmates played “Team Stella” bingo, pin the electrode on the brain (think “pin the tail on the donkey”), and hot potato while passing one of the teddy bears that will be donated to the hospital. 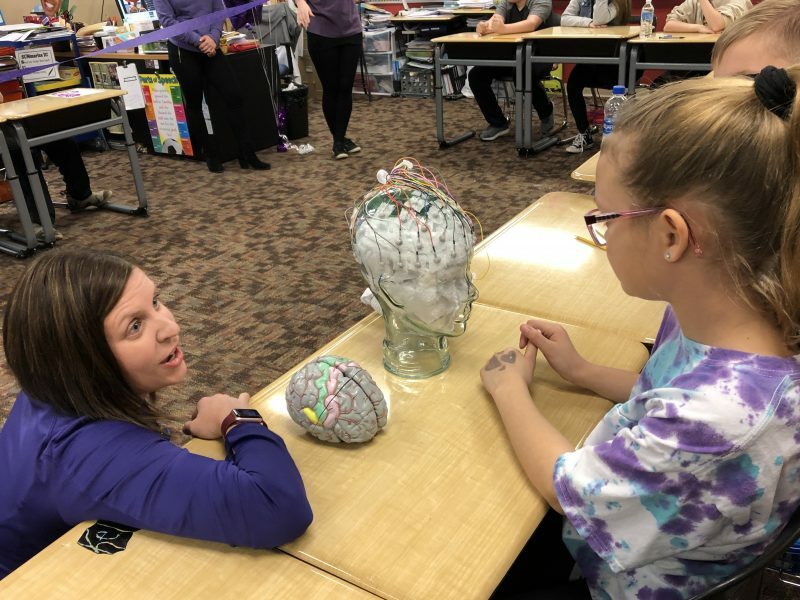 Joining the fun – and offering some epilepsy education – from Akron Children’s NeuroDevelopmental Science Center (NDSC) were Nurse Practitioners Amanda Delaratta and Mackenzie Feathers, and Physician Assistant Shawnelle Contini. Dr. Chinasa Nwankwo, Stella’s epileptologist, was unable to attend the party but surprised Stella with a FaceTime chat. 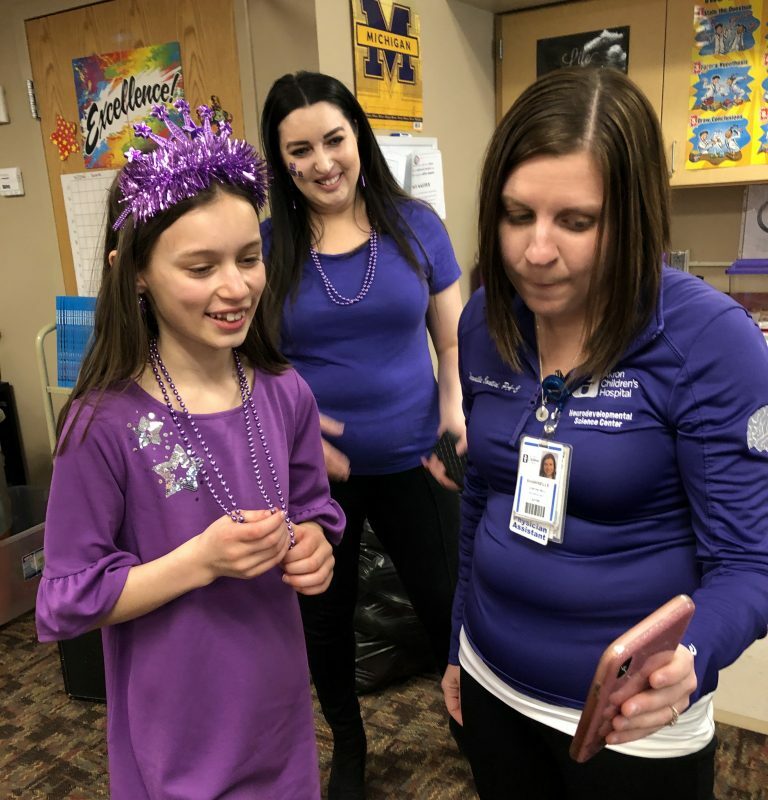 Stella Miller was surprised with a FaceTime visit from her epileptologist Dr. Chinasa Nwankwo, as mom, Andrea Jenkins, looks on. 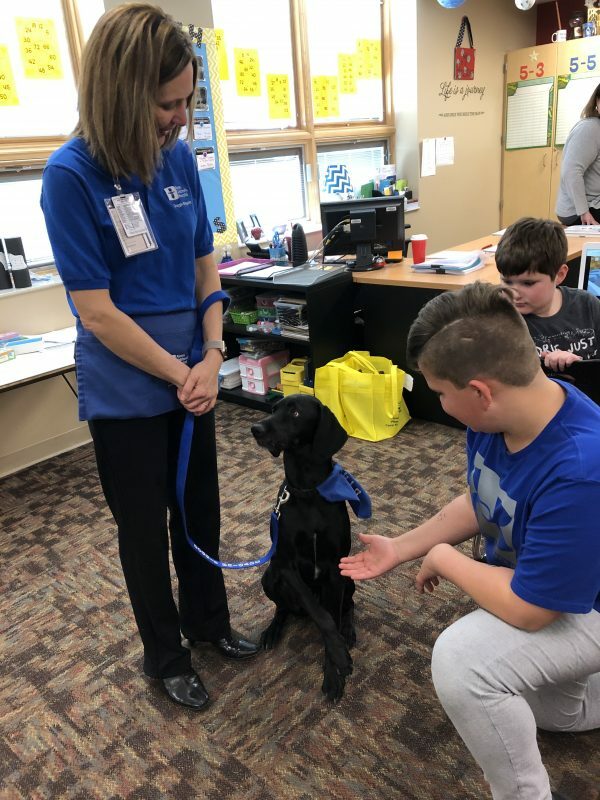 Nicole Spoonster and Emmet, a black lab and coonhound mix and a 2-year member of Akron Children’s Doggie Brigade, made their way around the fifth grade classes, serving as goodwill ambassadors for the hospital and answering kids’ questions. The 5th graders loved meeting Emmet, a black lab/coonhound mix and 2-year member of Akron Children’s Doggie Brigade. Volunteer Nicole Spoonster gladly answered questions and swapped puppy tales. The NDSC staffers led a quiz game and the students did very well in knowing that statements like “Epilepsy is contagious” and “I can swallow my tongue during a seizure” are common myths surrounding epilepsy. Winners were rewarded with purple glow sticks. They passed around a model of the brain and a model of brain with attached electrodes as it would be during an electroencephalogram (EEG), which records the electrical activity of the brain. Physician Assistant Shawnelle Contini passes around models to help explain epilepsy. Stella’s drive collected nearly 500 teddy bears this year, including 300 from the 5th grade classes at Stinson. Andrea and Stella we will deliver them to the hospital on April 4. Jayden Poorman and Adam Shrock were top teddy bear collectors in Stella’s class. Great job guys! Kyle Turley – clearly Team Stella – was another top teddy bear collector. 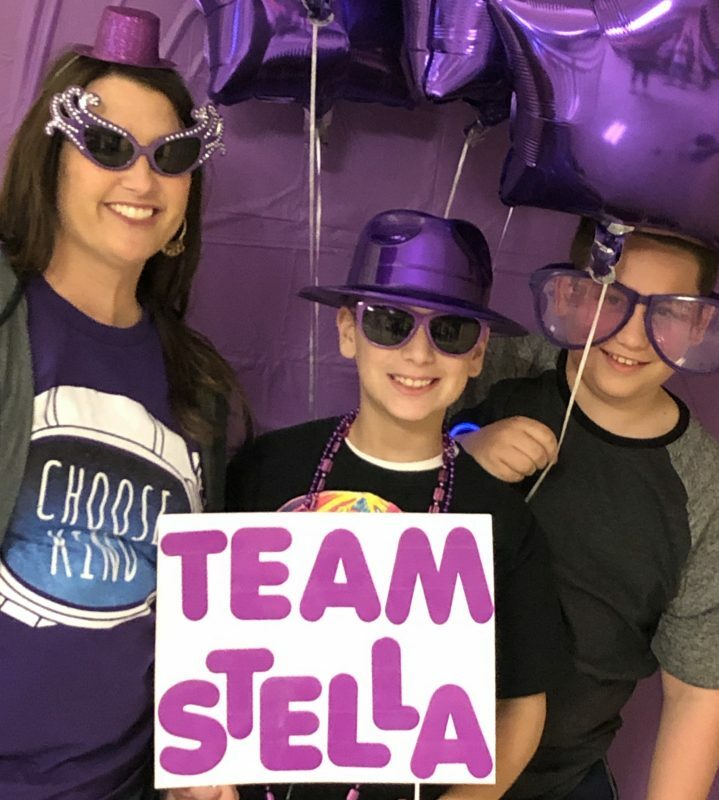 Teacher Amy Lower, and classmates Alex Mashburn and Vincent Lattimer are “Team Stella” in the Purple Power Photo Booth. Two weeks before starting third grade, Miller experienced several tonic-clonic seizures, also known as grand mal seizures. During her EEG testing to determine the cause of the seizures, a nurse gave Stella a rainbow-colored Beanie Baby and it was a great source of comfort. Class act! All six 5th grade classes gather in the gym for a group photo. As a group, they collected more than 300 teddy bears for Akron Children’s Hospital. Does your dog have what it takes to become a Doggie Brigade member?